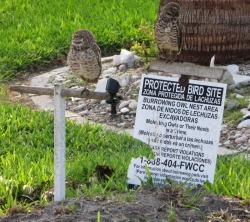 Our former Resident Burrowing Owl family could be observed at the end of the driveway. Maybe they will come back. You can find a nest on about every third or forth street in the Yacht Club area, although not everyone marks them for observation. The Owls's are quite tame and used to human's and their activities. If you really get close they will make some noise and bob their heads and display their wings, but other than that they are harmless and quite fun to watch especially when the young birds emerge from the nest in the late spring through summer. 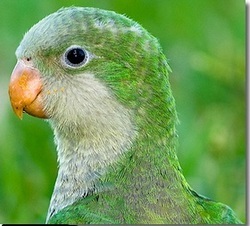 Quaker Parrots are small parrots about the length of a cockatiel - 11 to 12 inches), but the Quaker's body is heavier. They averages 12 inches or 29 cm in length (including the tail) and has a wingspan of 20 inches (53 cm). They weigh between 4.4 - 4.9 inches (127 - 140 g). Quaker parrots don't only build their own nests using twigs and other plant material, but they link their nests together to form structures akin to "bird condominiums" with individual chambers and separate nest entrances for each pay. These nesting structures can be the size of a small automobile and weigh 200 lbs (91 kg) or more. 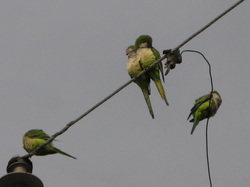 Quaker Parrots have a lifespan of 25 - 30 years. This is a Juvenal. 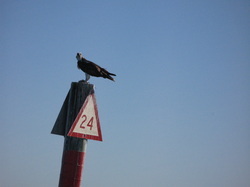 You will see Eagles and Osprey out on the water ways and on the gulf barrier islands. 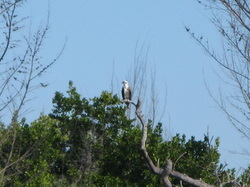 The Osprey is also known as the sea hawk, fish eagle or fish hawk. There very large with a 6' wing span (180 cm). The nest is a large heap of sticks, driftwood and seaweed. 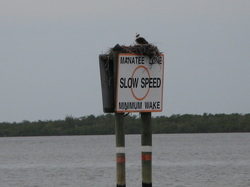 Osprey typically like to build their nests in high locations. However out on the water their content at lower elevations. I guess it gets them closer to their food. Ospreys have vision that allows them to detect underwater objects from 10–40 m (33–130 ft) above the water. The Osprey hovers momentarily then plunges feet first into the water to retrieve their fish which make up 99% of their diet. Ospreys are sometimes confused with bald eagles, but can be identified by their white underparts. Their white heads also have a distinctive black eye stripe that goes down the side of their faces. Eagles and ospreys frequent similar habitats and sometimes battle for food. Eagles often force osprey to drop fish that they have caught and steal them in midair.